Apple today introduced GarageBand for the iPad – a version of the company’s entry-level digital audio workstation, optimized for multi-touch mobile music making. GarageBand for the iPad could be a great new option for mobile audio podcasting – turning your tablet into a mobile recording studio for $5. Musical instruments designed for Multi-Touch. The iPad version of GarageBand will be available starting March 11th. GarageBand for the iPad will work with the existing iPad – but it will be interesting to see how performance fares. 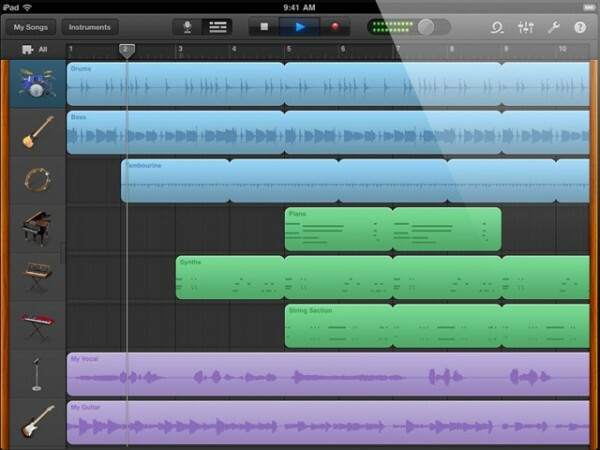 What do you think of Apple’s iPad GarageBand announcement? How would I use the “8-track recording”? Will there be an add on for the doc connector, that will let me plug in microphones? Until there is a good way to get audio in and out of the iPad, it’s going to be an enigma. I would be more excited if I could hook up a couple of real mics to it. Just plug in a USB mic via the camera connection kit. Not too complicated. True, but what I’m looking for is more than one mic at a time. What it the point of having 8 track recording if only one input is all the iPad can manage? Does anyone know? Is there a way to take Pamela recorded calls from Skype and get them into an iPAD? I installed this about 10 mins ago, and I must say I’m really impressed. Just as a live instrument toolkit, the guitar effects and keyboard sounds are very very cool – A midi keyboard into the USB adaptor is a whole lot of fun. Haven’t even tried recording yet, and it’s blown me away..